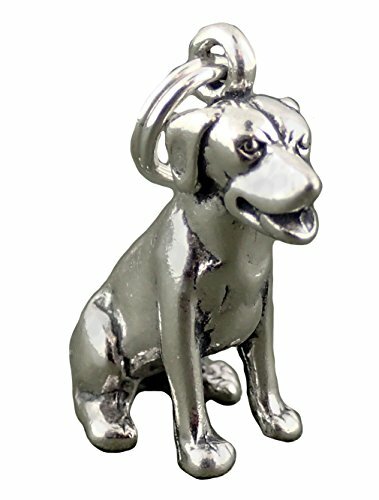 Labrador Dog Charm Pendant 3d. Made of 925 Sterling Silver. Approximate size 22 mm x 12 mm. JUMP RING: a circular ring which has an opening to attach thru a link on a bracelet or chain. For extra security we recommend having it soldered closed or it may come loose. Jump rings are not always perfectly round. To open a jump ring hold one side of the ring between your thumb and index finger. Use tweezers or pliers to hold the other side of the ring and slowly twist that side open just enough to complete your task. To close slowly twist the sides of the jump ring back into place with the tweezers or pliers so the ends meet securely once again. If you have any questions about this product by Corinna-Maria Charms, contact us by completing and submitting the form below. If you are looking for a specif part number, please include it with your message.